How can we achieve happiness in this life? How can we free ourselves from suffering? How can we help others to be free from suffering? 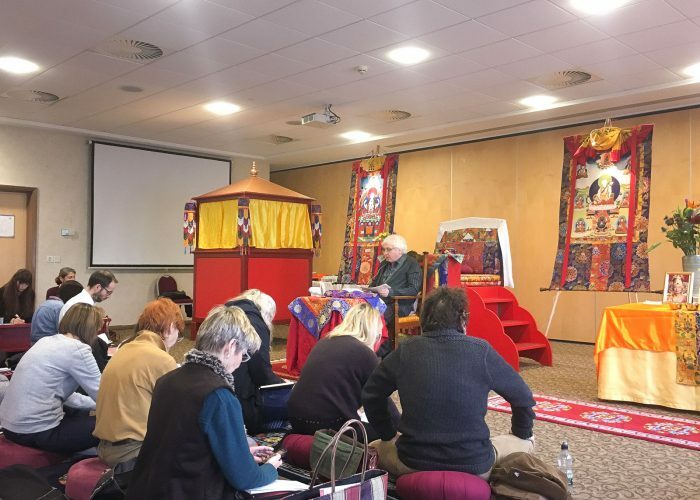 By some good fortune Bristol is home to the oldest Sakya Buddhist Centre in the UK, which makes the teachings of the Buddha available to anyone who is interested via a programme of classes but also, crucially, via regular visits from Lama Jampa Thaye. On this visit Lama Jampa began teaching a text called “A Garland of Jewels” written by one of the founding lamas of the Sakya tradition, Chogyal Phakpa, in the thirteenth century. It was originally given as advice to a prince in the royal court of Kublai Khan, the head of the Mongol Empire, however the relevance and value of this ancient text to ordinary people in the modern-day world is surprising. This teaching is divided into three parts. The first part provides guidance for a good life (the causes of happiness); the second outlines the path for liberation (freedom from suffering); the final part outlines the path to enlightenment so that one can benefit other beings and free them from suffering. The entire text is divided into 204 verses which cover the entire Buddhist path, from the level of a beginner to that of full enlightenment. Well over 100 people gathered to hear part one of this teaching on January 19th, and we look forward to hearing parts two and three later this year. In the afternoons of these teachings, Lama Jampa gives Vajrayana Buddhist teachings (initiations) which are open only to those people who have made a formal commitment to the Buddhist path by taking refuge. This January he gave the initiation of the wealth deity Ganapati (Ganesha). In June he will bestow the initiation of White Tara, and in October the initiation of Namgyalma. If you would like to learn more about these teachings or the classes being run at the Sakya Buddhist Centre please visit the “What’s On” section from the menu above.